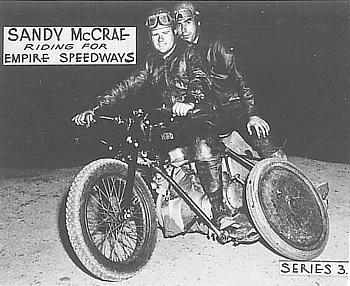 The Australian Speedway Sidecar Title was first held in the 1931 season at the Exhibition Speedway, Carlton, Melbourne and was won by Les Medlycott ( programmed as Art Medlycott ) with passenger "Tich" Jones. 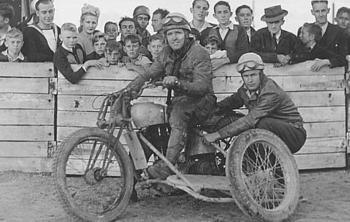 Although there were many Aussie titles run on 1 mile tracks in the 1920s and 1930s they are not included in these Speedway statistics. 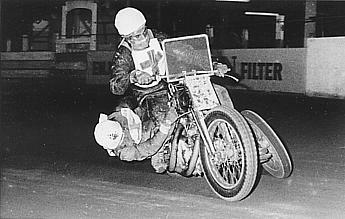 The next sanctioned Speedway title was then run in Sydney at the Sydney Sports Ground Speedway, after WWII, during the 1946 season. The 413 yd. Exhibition Speedway, at the rear of the famous Exhibition Buildings in Carlton, Melbourne,Victoria. 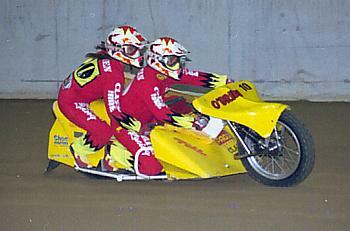 This was the venue for the inaugural Australian Sidecar Title meeting. the site of the old track. 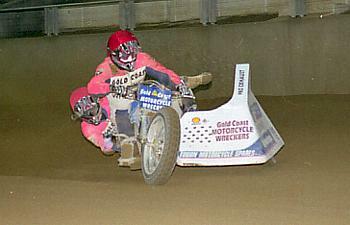 The Sydney Sports Ground Speedway 418 yard dirt circuit, in use for Speedway from 30th. October 1937 to 25th. March 1955. 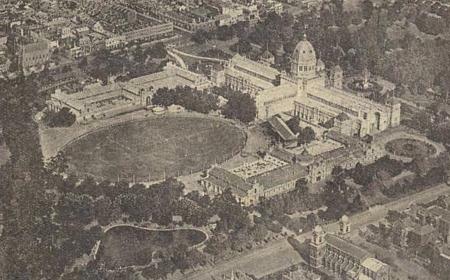 The ground had it's origin in the late 1800s as a General Sports Oval for use of the members of the military at the close by Victoria Barracks in Sydney, the dirt track was not laid until 1937. Season Track 1st Place 2nd. 3rd. Laps. 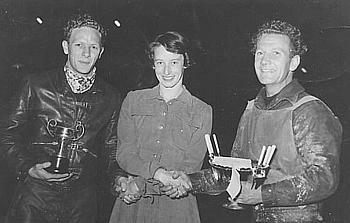 Promoters Gene Cowley and Mick Hede ( L & R ) Mr F.Yott of the A.C.U. presenting sash. 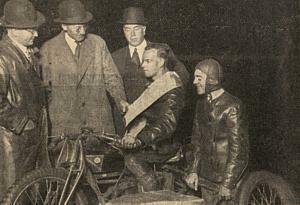 Les lost his life on 18.4.1933 after an accident on the Warragul Grass track on the 17.4.33. 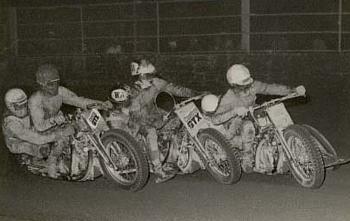 # 1949 3 lap title was scheduled for the Sydney Showground on 30/4/49, but on the night the A.C.U refused to sanction it as an official title because of a mistake in the heat draw and it was run as a "trophy" event instead. Jim Davies was to retain the title until it could be re-staged but no details of a re-staging have been found . 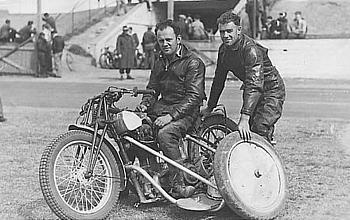 Charles "Chook" Hodgekiss and Charlie Kendall. 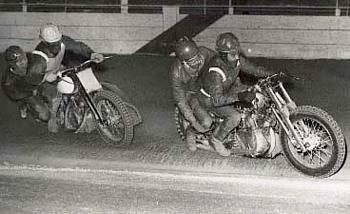 Doug Tankard with Jim Davies on the right. ## 1998 results altered at MA tribunal hearing 28/9/98 . *** 2002. Dave Bottrell/Shane Edwards finished 3rd. but were disqualified. 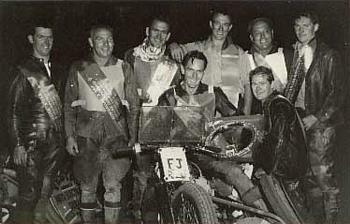 Glenn and Nathan O'Brien of W.A..
1964 L to R: Ray Holt, Charlie McConnell, Stan Smith, Laurie Noye, Harry Denton, Len Johnson, on bike Bruce Kelley and Barry Dienhoff.